January 15, 2009 – US Airways Flight 1549 makes an emergency landing in the Hudson River shortly after takeoff from LaGuardia Airport in New York City. All passengers and crew members survive. 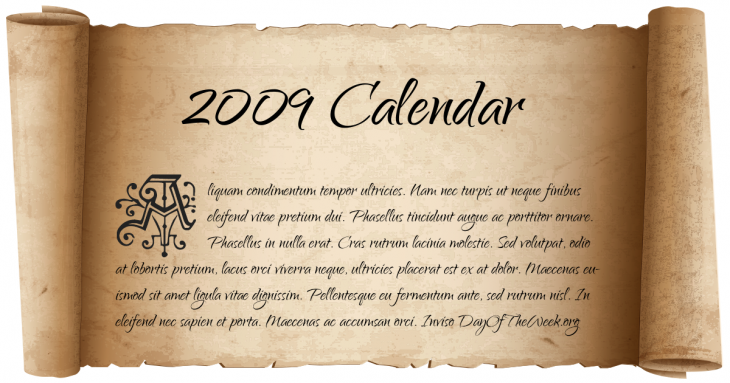 January 26, 2009 – New Year’s Day in Chinese calendar. Start of the year of the Earth Ox in Chinese astrology. February 10, 2009 – The communication satellites Iridium 33 and Kosmos-2251 collide in orbit, destroying both. April 30, 2009 – Chrysler automobile company files for Chapter 11 bankruptcy. May 31, 2009 – Anti-abortion activist Scott Roeder shoots and kills physician George Tiller during church services in Wichita, Kansas. July 5, 2009 – Roger Federer wins a record 15th Grand Slam title in tennis, winning a five set match against Andy Roddick at Wimbledon. September 30, 2009 – The 2009 Sumatra earthquakes occur, killing over 1,115 people. October 25, 2009 – The 25 October 2009 Baghdad bombings kills 155 and wounds at least 721. November 21, 2009 – A mine explosion in Heilongjiang province, northeastern China, kills 108. December 8, 2009 – Bombings in Baghdad, Iraq kill 127 and injure 448.
Who Were Born On 2009?